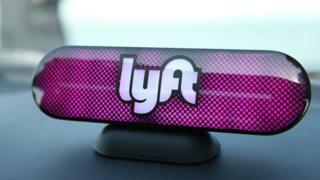 Analysis: By Michelle Fleury, New York business correspondentLyft's stock sale is a big moment for the tech industry.Shares in the ride-hailing company were priced at $72 a piece. This was at the high end of expectations. It suggests a strong appetite from investors ahead of the company's first day of trading as a public company.For a firm that is not yet profitable, it provides validation of its business model, one that has established it as the number two player in the US. Wall Street is clearly eager to take part in the massive growth in the ride-sharing industry. That bodes well for Lyft's rival, Uber which looks set to make its debut soon on the New York Stock Exchange.But there are risks: from regulatory uncertainty to the fierce competition likely to emerge as the autonomous vehicle market develops.And given its dual class share structure (Lyft is keeping voting control), investors are buying a little piece of a company in which they will have almost no say. Lyft was launched in 2012 by technology entrepreneurs John Zimmer and Logan Green, three years after Uber was founded.It remains the smaller company, with a limited international presence. Uber is expected to be valued at about $120bn when it goes public.However, Lyft's profile has risen over the last few years, as its larger rival was hit by controversy surrounding its aggressive corporate culture and data collection practices.Lyft now accounts for about 39% of the ride-share market in the US, up from about 22% in 2016, the company says.Lyft's revenues doubled in 2018 to reach $2.2bn, compared with $1.1bn in 2017, according to its filing with the US Securities and Exchange Commission (SEC).However, its losses also increased. The company lost $911m in 2018, up from $688m in 2017.